Inspired by a question posed by Jeff Shore recently, “who is worth following?“, I spent a lot of time pondering my response. Who we choose to follow and consequently why we follow them, is a conversation not had often enough. Outside of an occasional #FollowFriday, I rarely get recommendations from people I trust. Admittedly, I’m guilty of not advocating for my favorite follows enough either. And these follow recommendations infrequently come with as much intentionality, passion or enthusiasm as recommendations on a favorite TV show, a political candidate or new restaurant. With the advent of so many communication channels, the topical and niche options of people to follow are endless. From comedy, to music, DIY, news, sports, politics and beyond. Each choice to follow adds to the highly personalized, constant stream of content uniquely optimized just for me. Who I follow will determine how I view the world and ultimately become a reflection of who I am; or at least the person I want to be. As a result, others may consider following me based on who I follow. Furthermore, social platforms utilize this follow and follower data to make automated recommendations. I know we will all have our favorites, role models and heroes. So let’s talk about them. Because Jeff asked, I am presenting the first in a series of who I consider influential and worthwhile people to follow. 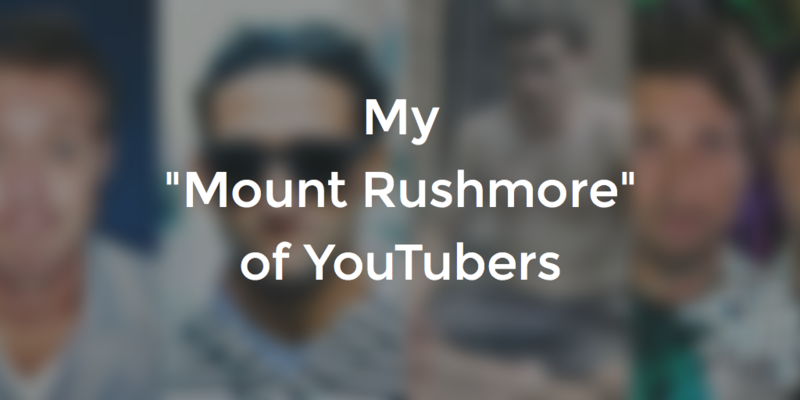 First up, my “Mount Rushmore” of YouTubers. Enjoy. Ze Frank’s internet fame predates YouTube, having created viral (Flash) videos as early as 2001. He was true artist embracing the Internet medium. His career was rich before YouTube launched; winning a Webby Award in 2002 and named to Time Magazine’s “50 Coolest Websites” in 2005. But it was in 2006 that “the show with zefrank” launched. His three to five minute, Daily Show-esque, commentary on current events set the tone for future Vloggers and YouTubers. Although the show ran for just a year, it influenced the next generation of YouTubers like Hank and John Green. Ze Frank hit the mainstream in 2013 with his “Sad Cat Diary”, a viral video that’s logged nearly 25 million views. This blend of sarcasm, humor and dead pan delivery set the stage for a deal with Friskies. The hits keep rolling for this veteran, including his “Guide To Candy Trading” and ultimately the “True Facts” series. Today, Ze Frank is the President of BuzzFeed Motion Pictures. To me, he is the George Washington of my Mount Rushmore. A wise and altruistic Founding Father. You might not know Casey by name. But you’ve almost certainly seen his videos. With the ability to seemingly go viral whenever he likes, we’ve seen him Turn Your Apple Watch Gold, Snowboard thru New York City and take a shower onboard a plane. Outside of YouTube, he’s just plain interesting. He made a TV show for HBO in 2008, is CEO of a Social Media video sharing app, and works with clients like Nike, Mercedes-Benz and Google. Casey is a master of B-Roll, framing, pacing and storytelling. In everything he does, the careful selection of music accentuates the message of each video. His masterful use of the camera is unrivaled on YouTube, which has already led to countless videos made in his likeness. He is a modern day, digital renaissance man, which is why he holds the place of Thomas Jefferson on my Mount Rushmore. Not one person, but two. Dan and Gavin are a duo of Phantom high-speed camera wielding friends, who turn the mundane to captivating. Shooting more than 343,000 frames per second, they help us see and understand the world around us. From fire, to paint, to glass the The Slow Mo Guys try it all. While they pack serious videography horsepower, there is a certain inelegance that comes across as endearing. Like two British pals goofing around after a few drinks at the pub. Seemingly living Theodore Roosevelt’s advice to “speak softly and carry a big stick”, this team takes Teddy’s place on my Mount Rushmore. There is more unknown than known about the man behind Primitive Technology. This newcomer to YouTube doesn’t even have a name. Filming barefoot from Queensland Australia, the dangers of the bush are abundant: snakes, scorpions, weather. Despite all this, our mystery man is seemingly able to rebuild civilization should the need arise. His stoic calmness is captivating. With time and knowledge, he proves anything is possible. Some might watch Primitive Technology as a DIY tutorial, but I believe his fame is built elsewhere. He exudes an inspiring, noble strength that speaks to the inner caveman in all of us. Without a single word in his 20+ videos, we follow along as he build a shelter, forges iron, and masters spear throwing. It’s because of his charisma and nobility that Primitive Technology is the Abraham Lincoln of my Mount Rushmore.